Looking for a tasty cookie that travels well whether you're enjoying it on a picnic, during a hike, or simply while sitting down at the dinner table? Give this sweet treat a try. I made these cookies to enjoy on a long hike I went on over the weekend. When I set out to make them, I envisioned creating a snack that was high in carbs as well as protein, yet didn't have any dairy. After a long climb—whether it be up a hill, trail, or into the woods—you're going to want some nourishment, but if your products contain milk, they might not make it for the long haul. If you're spending the day being active, packing non-perishable items is a must. This becomes especially true when warm weather hits. 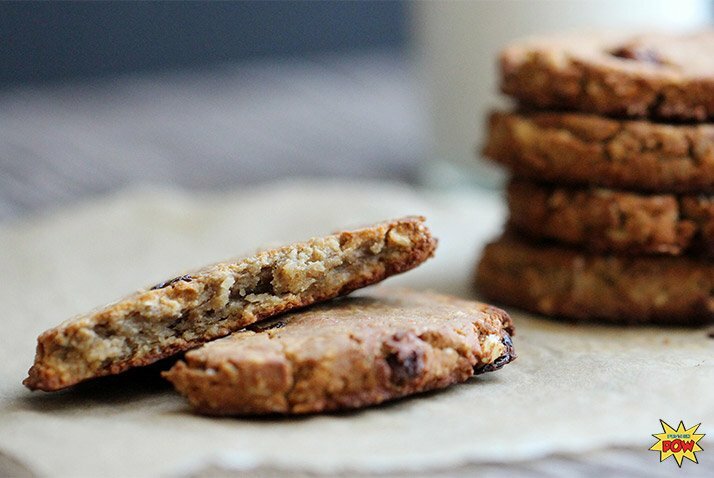 Keeping my conditions in mind, and still wanting to strive for something that was delicious and worth taking a 10-minute hiking break for, I came up with these protein cookies. I made them the night before, wrapped them in foil before I left the house, and took them with me up the mountains! They were absolutely perfect for the job—they stayed moist and delivered exactly what I was after—a shot of energy and a good old punch of delicious protein POW!er.